The SGS Pasture Model is a multi-paddock, biophysical simulation model for livestock systems. 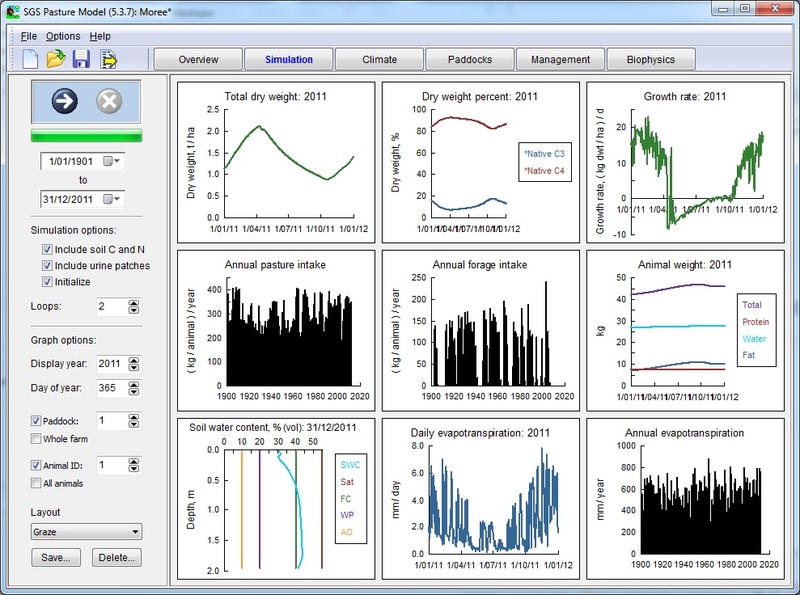 It has a flexible interface for setting up and running simulations with extensive graphical and data output. The model has been applied to a range of research questions, such as climate variability, drought, business risk, and the impacts of climate change. The SGS Pasture Model was developed by IMJ Consultants in collaboration with Meat and Livestock Australia, the University of Melbourne, and Dairy Australia. The current version of the SGS Pasture Model is 5.6.3. If you already have the program installed, click ‘Help, About’ to check your version number. If you are interested in using the program please contact Brendan Cullen at the University of Melbourne, who can provide you with a license key. The SGS Pasture Model is a daily time-step model with modules for pasture growth in response to climate; pasture utilization by grazing animals; animal physiology, growth, metabolism and lactation; water dynamics including transpiration, soil evaporation, runoff, infiltration and deep drainage; soil organic matter and nitrogen dynamics, including leaching and gaseous losses through volatilization and leaching. There are flexible options for pasture management, irrigation, fertilizer application, stock management and supplementary feeding strategies. The animal module has options to select sheep, cattle and dairy cows. The model describes animal growth and energy dynamics in response to available energy, and includes body protein, water and fat. Animal protein weight is taken to be the primary indicator of metabolic state, while fat is regarded as a potential source of metabolic energy for physiological processes, such as energy requirements during lactation. Animal intake in response to available pasture and pasture quality is described, as well as intake from supplementary feed. Feed composition has a direct effect on growth and metabolism, including lactation, as well as nitrogen dynamics and the nitrogen contents of dung and urine. The model includes methane emissions during rumen fermentation as well as the energy costs of dung and urine production. Johnson IR (2016). DairyMod and the SGS Pasture Model: a mathematical description of the the biophysical model structure. IMJ Consultants, Dorrigo, NSW, Australia.